Many years ago I embarked on a journey to jury for a show that has been long recognized as the Premier Art Show for Western FUNCTIONAL Art! The Western Design Conference brings emphasis on the WESTERN and FUNCTIONAL side of art. Held each Fall in Jackson Hole Wyoming the WDC is a kick off to the Fall Arts Festival also held each year in the town of Jackson. Some of the finest artisans and craftsman travel from all corners of the United States to show off their best functional art. In the past I have been honored with not only first place awards within my art category but I have also been honored with the coveted Sunny Tutle Award which is an award that represents an authentic Native/Western theme. Art collectors, enthusiasts, designers, and every day people come from all over to experience this show looking for something special. Each year I can attest to the amazing quality of the art presented. For several years I have entered this show each time with an art piece that was influenced by our history here in Wyoming. I have presented many different flute designs as each one of my entries is a fully functional flute ready to play at any time. These past entries had a very strong Native American influence consistent with our First Nations People’s history. For me these influences came mostly from the Plains history of which Wyoming is part of and each time I tried to present an authentic representation of what we now know as the Native American flute. This years entry was a hard one for me as I thought initially I would step outside my flute building craft and maybe try something new. But after weeks of agonizing thought I decided to create a piece consistent with what I have become known for and yet still step outside the box I have been so accustom to being part of… which is to say keeping it old school. This years entry is the first flute that I have painted and then lacquered to a high gloss. This years art piece represents a marriage of the old and the new. My goal was to seek and find Simple Elegance all the while bringing honor to this great two chambered wind instrument. 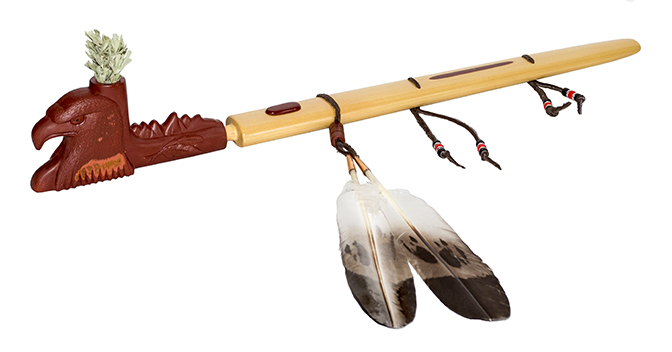 The contemporary side of this piece represents all that is new with both the journey the Native American Styled flute has traveled, the history of it’s origins and what is new in American life on our reservations. I hope it brings a smile to your face! Crafted from a single piece of Old Growth Alaskan Yellow Cedar this 1 inch bore flute is tuned to the key of E @ 432Hz. Painted black on both the inside and outside this flute was finally finished with 30+ coats of hand applied high gloss lacquer. The Totem rails and the totem are hand crafted from an piece of Old Growth Maple harvested in Colorado. The totem or fetish theme is the powerful Mustang. Set into the body of the flute is a hand cut cabochon of Elk Antler harvested right here in Wyoming. The elk antler is bezel set in Sterling Silver and then inlaid into the flute body. All leather accents are from hand cut Elk hides and the beading is both black and red Crow Glass Beads separated by sterling silver beads. The stand is hand crafted from American Black Walnut and also painted in the same way as the flute body. The only difference is that the stand has a semi-gloss finish. The red cloth you see is a traditional red trade cloth color. Both flute and stand are available for purchase at the show and beyond. If you are interested in this one of a kind Jackson Hole Tim original reach out to me through email or phone. This piece is also available for commission and you can set the color theme. The flute continues to take its path to final form. Here is an updated picture during the finishing stages of this flute. Here you can see how the Maple rails and totem look against the jet black finish. The Elk Antler Cabochon is about done and ready to set into the flute body. This flute in person is beautiful. The fetish design selected is my Mustang Themed fetish. Hand carved from a solid piece of old growth maple this fetish will be finished with a clear lacquer to preserve the natural beauty of the wood. The flute body is now in it’s finishing stages. The body is Jet Gloss Black with a hand crafted Elk Antler Cabochon set in Sterling Silver. I am still working on the bezel but will post pics shortly. Flute takes shape. Tuning holes are marked and ready to give voice. I am going to voice the flute and find the fundamental note, tune it and then start the finishing process. So far this is turning out to be a very nice flute. All glued up and tuning holes and the Four Winds tuning holes are marked. This will be a E at 432 Hz as I see it now. This is the ugly stage of the flute process. From here the birth of this flute will truly begin. So many point to cover but watch for the next update to see how this Western Design Conference entry progresses. Here you can see the beginnings of the Maple Totem/Fetish rails. Soon they will take shape and add to the overall elegance this flute will display. I have just completed the cutting and finishing of the Windway and the inside of the flute bore. Ready for Glue Up and later today we will start with the addition of the Totem Rails. Because this project is slated for a complete GLOSS BLACK finish it was important to make sure the inside was pre-treated as well. I have selected a very nice piece of American Maple from which these rails will be made from. They will be natural in their finish and should really accent the black coloring. I am excited to get the rails on and start the shaping process. This should be an exceptionally beautiful flute when done… a bit outside my traditional crafting but then that is what makes it fun! I am once again excited for the upcoming Western Design Conference to be held in Jackson Hole Wyoming September 6th thru the 9th at the base of the Snow King Resort. Each year some of the BEST Functional Artists from all over the United States jury for entry into the WDC. Last Fall for the 2017 WDC I decided not to participate and become a spectator. I have to admit once I arrived to view other artist’s entries and see some old friend I wish I had entered the conference. As a returning two time award winner in the category “ACCENTS” I am always excited to see how the judges view my craft. Crafting unique Plains Influenced art is a passion that I have followed for quite some time. This year I have decided to enter a juried piece that will be the first Native American Styled flute I have made that I have painted with the idea to have a more contemporary appeal. This years piece will be for sale prior to, during and after the conference. This flute is being done completely on spec. The picture at the top of this post is an image of the actual flute blank that will become this years entry. This image is the ugly beginnings of what will be an amazingly beautiful flute. The flute is being crafted from a piece of Old Growth Alaskan Yellow Cedar. I have select this wood species for it’s ability to produce a beautiful sounding flute. In addition Alaskan Ceder when finished finishes like glass and is the perfect medium for the acrylic and lacquer finish it will receive. This flute will be a 1 inch bored flute and will feature Old Growth American Maple totem rails with the totem to be my newly design whimsical Mustang fetish. The bore of the flute will feature a Stirling Silver bezel set cabochon hand made from Wyoming Elk Antler. The actual antler piece that the cabochon will be crafted from is seen below. This will be set into the body of the flute and should pop right off of the black setting with a high polished bezel to really give it a classy appeal. This flute is available for purchase at any time during the construction of the project. Although the price has yet to be determined I can assure you this will be a one of a kind Timothy Jennings crafted flute. Delivery will not take place until after the Western Design Conference. Any winnings during the conference belong to the artist. If you are interested please complete the form below. Check back from time to time to see the journey this flute will make from concept, to craft stage to voicing. This flute will be voice at the base of the Tetons later this summer. Key will probably be in the lower D – E range. If you have questions reach out to me at “Sales@Jacksonholetim.com” or call me 307-690-0427. Each year Jackson Wyoming is host to the Western Design Conference which opens the Fall Art Festival held each year in Jackson Hole.. WDC is one of the premier shows that features “Functional Art”. Every artist must be juried in to be part of the annual event and their art must be a functional piece of original work. Some of the best artists this country has to offer attend this 3 day event. This summer Images West magazine has highlighted several WCD Artists in an article titled “Functional Art”. We were so proud to be considered for this article as one of these artists. On page 30 you can read about some of the artist’s and their work, including ours.